I have provided many services for my clients, efficiently and cost effectively. The list below is by no means exhaustive, so if you do not see exactly what you are looking for below then please contact me as I have more than likely missed it off my list! You will find that I am completely open, honest and totally reliable. I pride myself on being meticulous and conscientious. I enjoy my work and I take a great pride in it. I also have a very wide range of professional contacts that work in many specialised areas and who would be able to provide you with the exact service that you’re looking for. Call me on: 01223 244 442 or my mobile: 07742 003 497 or email me: david@davidattlesey.com You’ll find my prices are very reasonable and I’ll be happy to help you out wherever I can! 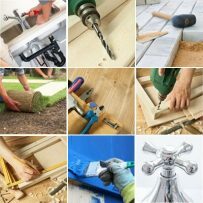 I'm a professionally trained tradesman, ready to undertake handyman jobs in Cambridge and around Cambridgeshire.